How Many Of These Lesser-Known Beaches Did You Have A Clue About? Alibaug is a no-brainer kind of a weekend getaway from Mumbai, the lowest hanging fruit. Thanks to a super easy access from Gateway of India, or even by road Alibaug has a string of beaches that offer a variety of things to do. So whether you want to go water sporting, or spend some quiet time watching the sunset, there’s something for everyone there. Uncluttered and clean, Nagaon beach is one of the cleanest beaches in Alibaug. With coconut trees on side mixed with betel nut plantation, and clean sea on the other, this beach also offers water sports to make your day spent here worthwhile. A vantage point to the Murud-Zanjira fort, Murud beach is clean and gradual which makes it apt for the kids to jump around and go for a short swim. It also has sports like paragliding and parasailing and has many lodging spots too. Also, the fort is just a short ferry ride away and is a great spot to explore as it boasts of remaining unconquered despite multiple efforts by Dutch, British and Maratha armies. This is the one bustling with tourist and is one of the most popular beaches in Alibaug. Also serving as the naval base, this beach will satisfy your greenery seeking soul. It also has a patch of rocks on the coastline which makes for a good spot to relax and watch the sunset. Abutting the Indian-Portuguese town of Korlai is this beach which has a mix of both white and black sand. 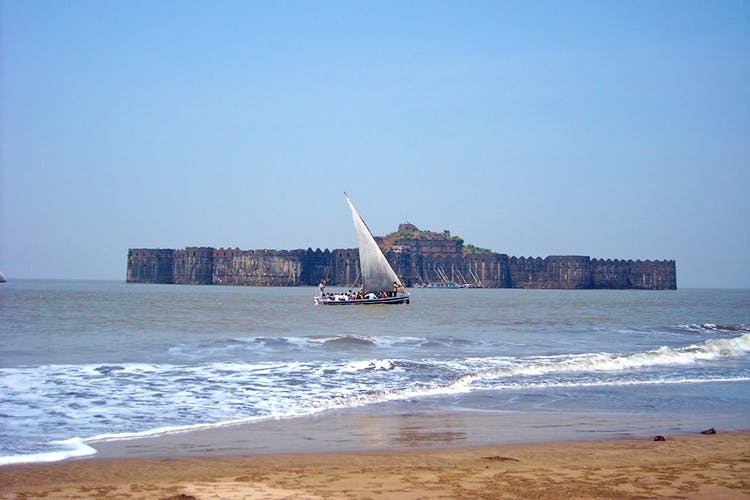 And the highlight of this place is the Korlai Fort, located in the middle of the sea accessible through a bridge. A nicely fortified fort, it has many spots where you sit to enjoy an aerial view of the Arabian Sea. And while at it, we suggest you get the Dil Chahta Hai fort photo as well. If you’re looking for less crowd and a more peaceful time, Kasim beach is one of the less explored beaches on the Alibaug stretch. With sparkling sand and clear waters, this might be the spot your introspection needs. Or if that got too heavy, it’s pretty awesome for just a walk too. Ask the locals for deets, as it’s not marked on Google maps.